Concrete driveways and sidewalks attract mold and mildew faster than any other element around your home. As a result they lose their new appearance and begin to show green or even black mold and mildew. Pavers and Concrete are very easy to clean and is an inexpensive way to improve your home’s curb appeal. Therefore anyone partaking in spring cleaning or listing their home for sale should try out our pressure washing services. Most noteworthy we are great at cleaning Driveways, Sidewalks, Curbing, Pavers, Patios and more! We here at The Pressure Kru, Inc. utilize the proper cleaning tools, equipment, and most of all chemicals so that our customers can be confident their hardscapes will be looking their best! As a result when you hire us it takes the guess work out of knowing if the job will be done right. 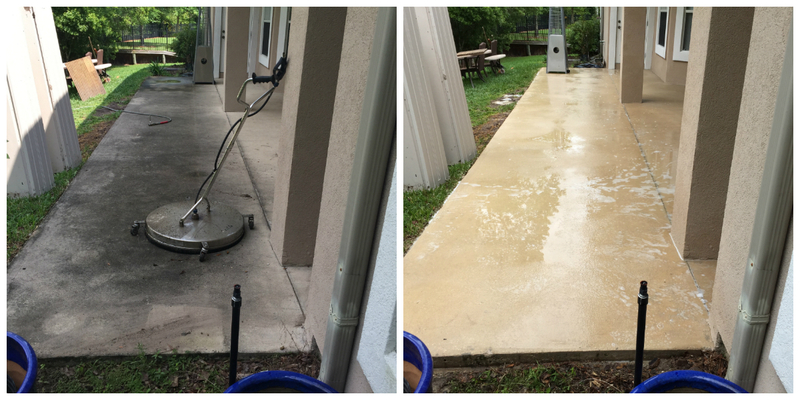 Hiring the wrong Pressure Washing Contractor will result in mediocre quality or even worse, damages to your concrete could occur. When time is of the essence and a turbo nozzle still isn’t fast enough, a surface cleaner is the answer. Surface cleaners have two to four additional spray tips under their housings. As a result they get the job done faster. They’re not going to always be the solution to tough, settled in stains, but they’ll cover more surface area in less time. As you push the surface cleaner across your concrete or pavers, multiple spinning jets of high pressure water blast away stains. Most of all the end result is a much more consistent and uniform clean. -Most jobs can be scheduled within 24 hours. Simply fill out our online estimate request form and get your free quote today. We price homes by the lineal foot and all flatwork by the square foot. We clean up your residence while your at work. Enjoy coming home to a clean home.